This was taken with my iphone- it's an old rusty truck bed that has been on our property for many years. Interesting image, especially the way the rust forms are concentric. I once took a photo of a cloud that looked similar. I call it “Spanish Dancer”. Cindy, a striking abstract iphone image. And the title is so fitting. The happy dancer makes me smile. 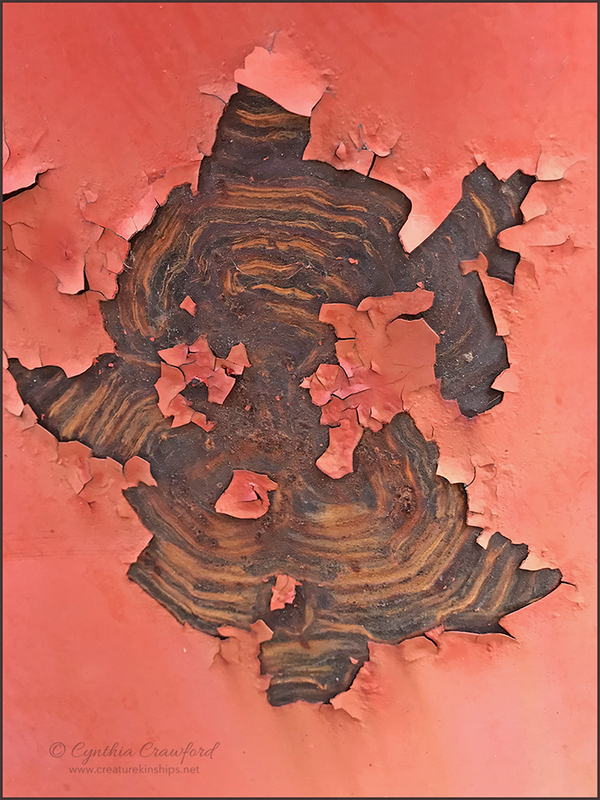 Love the peeling paint — a great abstract. Cindy, how strange but effective for there to be concentric lines under the paint, the movement it creates, makes for a jubilant dance! Even the color of paint has a whimsical south of the border feel, adding to the celebration. Very well seen and taken! What a fun, happy scene! I see a dancing Hippo in a flamenco skirt. Thanks, Joe. It would be fun to see you "dancer"! Thank you Ron- I was hoping it would bring a smile! Thanks, Lynn- it IS strange what patterns have appeared in the rust- I don't know why, but they are very interesting. It’s stashed away somewhere with my tens of thousands of slides. Someday, if I come across it, I will post it here.